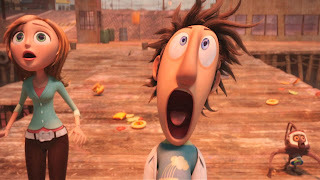 Animated Film Reviews: Cloudy with a Chance of Meatballs (2009) - A Food-alanche of Fun!! Get Ready for a Giant Food Fight in ChewandSwallow! 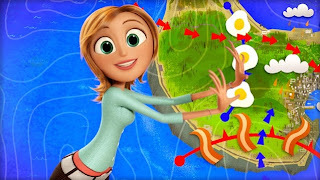 "Cloudy with a Chance of Meatballs" (2009), a computer-animated science fiction film from Sony Pictures Animation, stems from the children's book of the same name. 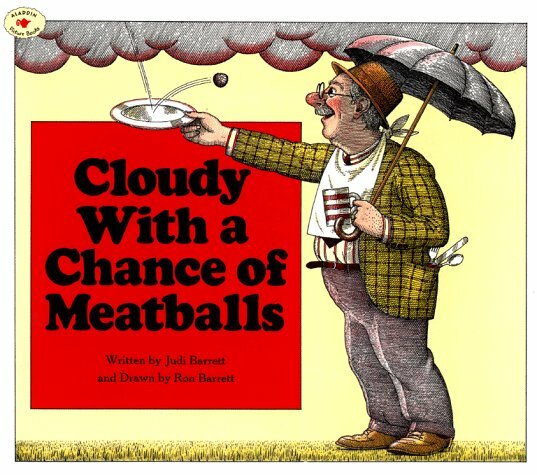 Written by Judi Barrett and illustrated by Ron Barrett in 1978, the book is a favorite of teachers who are teaching their students how to read. With that kind of built-in audience, it was only a matter of time before an animated feature film arrived. This is a good one, though the adaptation does differ from the book in many significant respects. 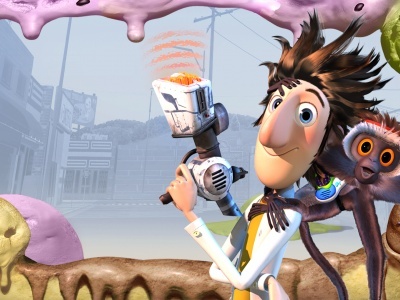 Loaded with congenial voice actors like Bruce Campbell, Al Roker and Neil Patrick Harris, and directed by Phil Lord and Chris Miller, the film was a hit that has resulted in a sequel, "Cloudy with a Chance of Meatballs 2." 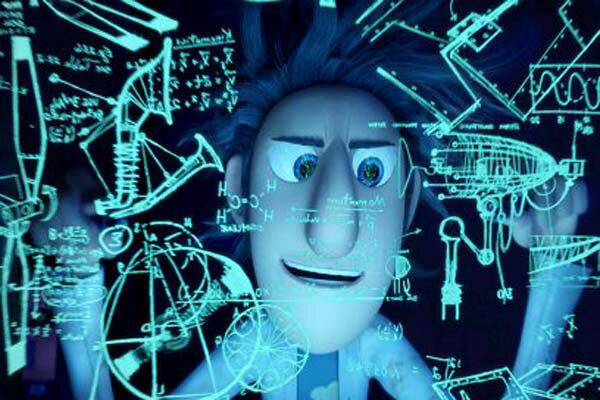 Flint Lockwood is an eccentric inventor who lives in Swallow Falls, a small town in the middle of the Atlantic Ocean. Flint's inventions, such as a hair un-balder and a flying car, haven't been too successful. In fact, they haven't succeeded at all. Flint's father, Tim, is a nice man but doesn't believe in Flint's inventions. The whole town is dependent on one industry and is forced to live on the only local product, sardines. Flint's best friend is his pet monkey, Steve. 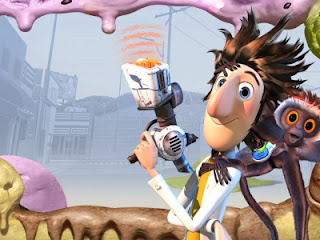 In order to create some different food for the town, Flint invents a "Flint Lockwood Diatonic Super Mutating Dynamic Food Replicator" (or "FLDSMDFR" for short). This device turns water into food. He has some trouble with it, though, and it blows the circuits in his house. Hooking it up instead to the local powerplant, the machine gets supercharged and rampages through town, destroying the new tourist center and rocketing up into the atmosphere. Unhappy about his newest failure, Flint meets Samantha "Sam" Sparks, a weather intern who is out of work because of the destruction caused by the FLDSMDFR. While they are talking, Flint and Sam find they have some things in common, and then the unexpected happens - rainbow-colored clouds overhead begin raining cheeseburgers. Now that he has found out that the machine works, Flint begins sending it signals to rain down different kinds of foods. The townspeople are happy and rename the town "Chewandswallow." Tourists come from around the world to witness the food rainfalls. The townspeople, however, start requesting more and more food, and they grow fatter and fatter. The increasing demands for food creates a deadly tornado composed of spaghetti and meatballs. 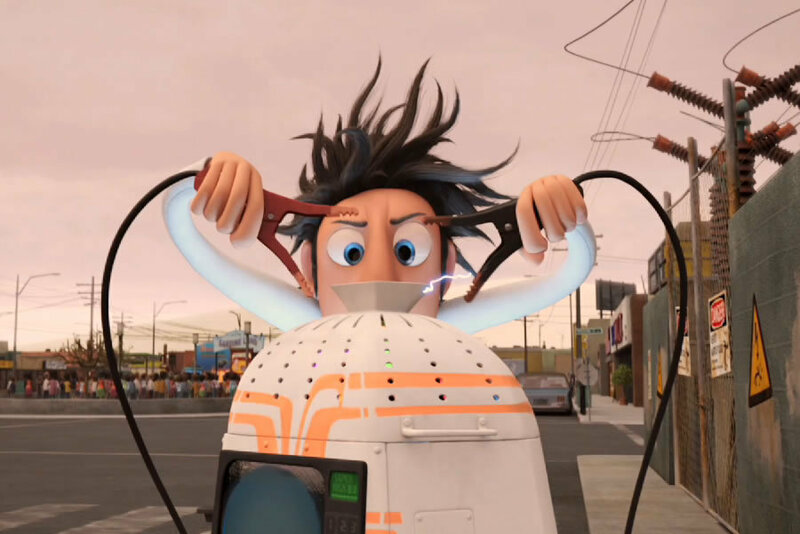 Flint tries to turn the machine off to save the town, but the Mayor throws a radish at his radio and destroys it. With the world threatened with destruction, Flint returns to his earlier inventions and gets his flying car to work. Flint and Sam, along with her crew, set out to deactivate the FLDSMDFR using a "kill code" in a USB flash drive. The machine, however, is protected inside a giant meatball, which tries to kill them, and during the attack, Flint loses the flash drive. The Chewandswallow townspeople flee as the nearby mountain, Mt. Leftover, collapses and unleashes a food-alanche that destroys the town. Tim, however, stays in the lab even as it is covered in leftovers and manages to send a kill code to Flint's cellphone. Flint managed to penetrate the meatball protecting the FLDSMDFR and plugs his cellphone into it to turn it off. The code that Tim sent, however, does not work. Thinking fast, Tim uses another of his inventions, for Spray-on Shoes, and that destroys the FLDSMDFR. The town is saved, Tim finally respects Flint, and Flint and Sam kiss, and the Mayor gets his just desserts. It isn't often that you will find a children's book that is centered around food and how to make it, and the film pulls out all the stops in trying to make everyone who watches it as hungry as possible. It is full of quirky humor and slapstick comedy, but the core, as with any successful animated film, is the successful drawing of real-life relationships. One can make the complaint that everything is over-the-top and a bit obvious at times. The most reliable and, thus, over-used theme in animation is the clever-but-misunderstood young genius who just can't get people to accept how wonderful he is (see, for instance, the wonderful Disney film "Meet the Robinsons"). "Cloudy with a Chance of Meatballs," though, is a children's film and should be appreciated as such, not measured against the standards of jaded critics who have seen too many animation films for their own good. For sure, "Cloudy with a Chance of Meatballs" is not the most original plot ever devised, but you can also say that "Cloudy with a Chance of Meatballs is a colorful feast for the eyes with child-friendly characters that should please its intended audience. The engaging cast adds to the fun. Bill Hader plays Flint, while Anna Faris is properly spunky as Sam. Film veteran James Caan plays Tim with his usual panache, while television star Neil Patrick Harris, who also is busy these days as a lead character in "The Smurfs" and "The Smurfs 2," voices Steve the monkey. Bruce Campbell is appropriately evil in his avuncular manner as the Mayor who almost winds up destroying the world, while Andy Samberg, Mr. T, Benjamin Bratt and Al Roker round out the cast. Mark Mothersbaugh created the amiable soundtrack, which features such classics as "Inside the Meatball" and "Sunshine, Lollipops, and Rainbows," sung by Lesley Gore. "Cloudy with a Chance of Meatballs" was a minor success at the box office, only earning $243 million on a budget of $100 million, but that was enough to put a sequel in the works. Partly, that is because the film has done very well in the aftermarket. 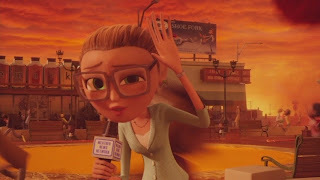 "Cloudy with a Chance of Meatballs" was released on DVD, Blu-ray and PSP UMD on January 5, 2010 in the United States and Canada, while a 3D Blu-ray was released on June 22, 2010. A measure of Sony's satisfaction with the film is that "Cloudy with a Chance of Meatballs" was the first 3D Blu-ray sold individually in the United States, which was quite an honor. 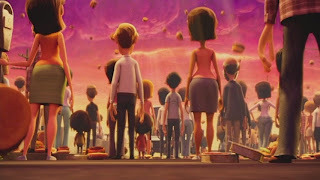 While "Cloudy with a Chance of Meatballs" undeniably is a children's film, derived from a children's book, and clearly intended for children, adults can appreciate the advanced computer animation and the obvious romance developing between Flint and Sam. This is a terrific film for parents to watch with their children, especially if the children have to read the book for class. 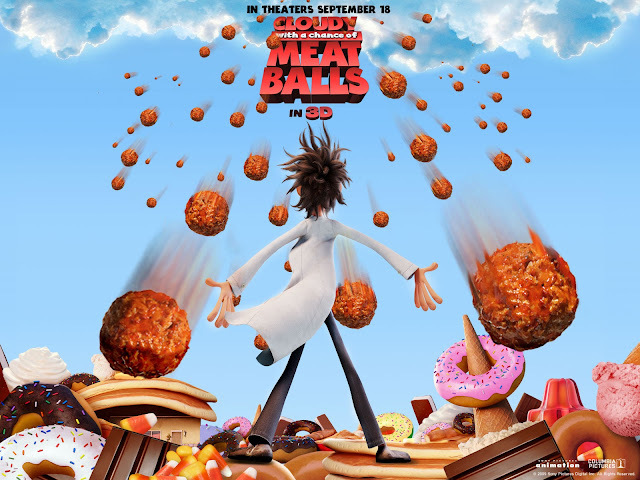 Below are the trailers for "Cloudy with a Chance of Meatballs."